It’s the Advent season, a time celebrated by many churches in anticipation of Christmas. Advent begins the fourth Sunday before Christmas, so today, November 28, 2010, is the first Sunday of Advent. Traditionally, the first Sunday of Advent is devoted to preparation; making ready for the miracle of God coming to live in our midst. This morning I listened as my pastor, Ryan, shared a message based on the Christmas carol, Joy to the World. His first point emphasized how important it is to rid ourselves of the clutter in our lives. I was reminded of a small devotional book that I read a number of years ago. Written by Robert Boyd Munger and published by Intervarsity Press, this book is a reminder of the preparation that followers of Christ need to make in order to make room for him. Every follower of Christ has, at some point, made the choice of inviting Christ into his or her life. And he moves in as promised. Paul describes it as “Christ in you, the hope of glory.” (Colossians 1;27) But, as Munger notes, there’s more to what Christ wants to do once he moves in. In the booklet the author likens his life to a home with various rooms. At first he invites Christ into the study, which symbolizes his mind. As we allow him to, Christ transforms us by the renewing of our minds (Romans 12). Secondly, the Lord is invited into the dining room, the place of appetites and desires. As we allow him into this part of our lives, he gently reminds us that he will grant us the desires of our heart, meaning that he will show us what is truly important and give us a thirst for righteousness the he alone can satisfy. As he goes from room to room the Lord transforms the life of this new believer, until the Christian comes to the realization that what he needs to do is to give Jesus the title deed and turn the entire dwelling over to him. You can read the entire treatise online. I encourage you to search for it. As you prepare for Christmas, let me encourage you to make room for the Lord this year. "Oh come to my heart, Lord Jesus. There is room in my heart for Thee." Imagine that. Before the law had been given, and before Abram had undergone ritual circumcision, God had already declared him righteous. In other words, Abram was righteous in God eyes, not on the basis of anything that he had done, but simply on the basis of his belief in God’s promise. The same is true for us. God says that he loves us and that he has sent his Son, Jesus, to offer his life as a sacrifice for sin. If we believe him, and place our faith in Christ, God says he will declare us righteous. Thanks for fighting for our country. And protecting our country, Mr. Lt. Fendley. And I think you’re very brave for fighting in the Army. 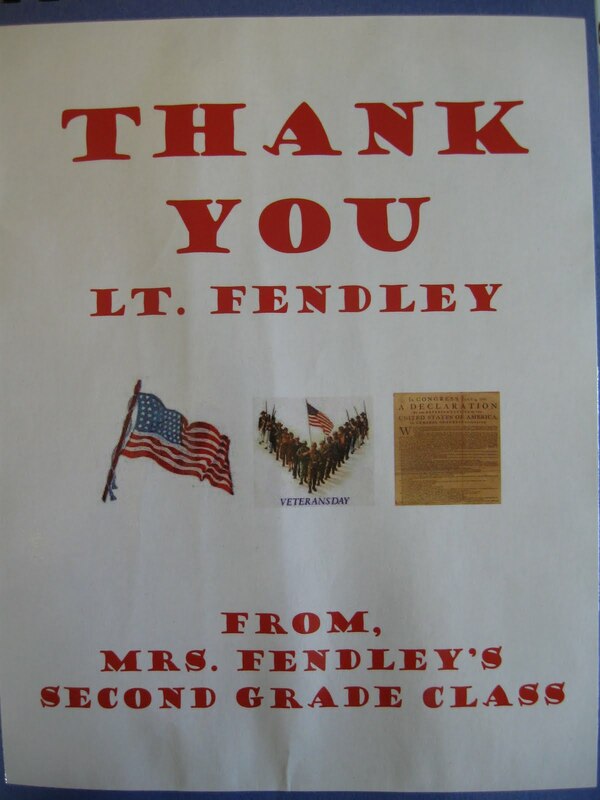 So reads the first of the two dozen letters I received today from Mrs. Fendley’s second grade class after my visit to talk about the meaning of Veteran’s Day. 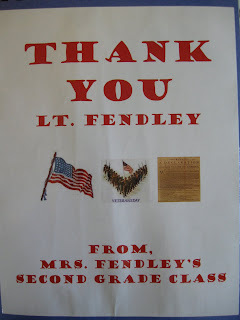 Mrs. Fendley, my son’s wife, is in her third year as a public school teacher, and she wanted her class to understand why we celebrate this day each year. I was all too happy to accept her invitation to come and talk to them. I arrived at the school right as they were returning from lunch, carrying some of my trinkets – medals and memorabilia – and a few photos. I hoped I was prepared to explain to these second graders the significance of this day we set aside to honor all our veterans. As I began, I held up the words to that great statement of our rights from the Declaration of Independence and asked for a student to volunteer to read it. A dozen hands shot up. I called on one of the students. I had to help him with a few words – self-evident, created, endowed, Creator, and unalienable - but otherwise he did great. Next I translated this statement into language that second graders were more likely to understand. It is easy to see that God gave us rights that can’t be taken away. They include the right to live, to be free, and to be happy. Then I told them about my experience as a combat commander and showed them some of the memorabilia. "This pin lets you know that I was an infantry officer. That’s what these crossed rifles represent. And this silver bar is my insignia of rank. It means that I was a first lieutenant. And this pin that says ‘Follow Me’ represents the infantry school at Fort Benning." I showed them other pins and ribbons: the Vietnam Service Medal, Bronze Star Medal, and unit pins, plus one of my dogtags. Then I put my CIB under the projector lamp. As it showed up on the screen, the children let out a collective "ooh." "This," I said, "is the most special pin I own. This is the Combat Infantryman’s Badge, which every infantry soldier receives for combat service." And, of course, I had to show pictures. I didn’t have any that were taken out in the boonies, but I did have photos that I took after being reassigned to a fire support base in command of the battalion heavy mortar platoon. Among the pictures were a Chinook helicopter carrying supplies in a cargo net, a Huey loaded with supplies and a few soldiers, a photo of one of the 4.2” mortars being fired, and lots of shots of sandbagged bunkers. I also had a few that I had taken while seated in a Huey – again, after my redeployment to LZ Maude, our firebase. This was followed by questions. "How many weapons did you fire?" asked one of the boys. "Well, let’s see. M14, M16, 45 caliber pistol, 50 caliber machine gun, M72 LAW, 40mm grenade launcher, M60 machine gun, 81mm mortar, 4.2” mortar. I think that’s everything." With every one I named his eyes grew wider. "Did you go in helicopters?" "Yes, in Hueys, Chinooks, Loaches, but mostly in Hueys. My platoon was carried by Hueys from the rear out into the mountains and dropped off there. Then a couple of weeks later they would come back and pick us up, returning us to the rear for a few days of cleanup. Then we’d pack up our rucksacks with food, ammo, and clean clothes, climb back onto the helicopters, and fly out to some other area in the mountains." One of the girls asked, "Did anybody get hurt?" "Yes. Some got hurt very badly, and some got killed. If you go to Washington DC you can see the names of over 58,000 young men and women who were killed in Vietnam. One of the names is a first cousin of mine who was in the Marines. Another is a dear friend from high school, and another is the name of my radio operator who was killed on my daughter’s third birthday." I ended my talk by suggesting three things they could do to honor veterans, not only on Veterans Day but any time they encountered one of us. 1. Be thankful. If you see someone in uniform, or wearing something that let’s you know he or she is a veteran, and your mom says it’s okay, tell them thank you for your service. 2. Be patriotic. Say the pledge of allegiance like you mean it. Stand tall and still when the flag passes by, with your hand over your heart. Stand tall and still until the last note of the Star Spangled Banner. 3. Be a good citizen. You honor those who fought for your rights and your liberty by following the rules, and obeying your teacher and your parents. I hope I left them with a better understanding of Veterans Day. But I know that they left me feeling blessed by the book of letters they gave me. I’ve got to share a few more, edited and spell checked. These are second graders, after all. Thank you for sacrificing for our country and keeping is safe. We are happy that you were fighting. You are brave and bold. We thank you for all you do. When you fight you are brave. You are a good person. And we hope you do not change. THANK YOU SO MUCH. Thank you for sacrificing your life for our country. You are very brave to go in the Army. Thank you for fightiing for our rights. It must be hard to do things to fight for the country. We thank you for doing that. I’ve been asked by my daughter-in-law, who teaches second grade in public school, to come to her class tomorrow and do a presentation about the meaning of Veteran’s Day. It’s a daunting challenge. Now I’ve never been one to shy away from public speaking. However, notwithstanding my thirty years of ministry as well as preaching and singing in front of large audiences, I find myself at something of a loss when it comes to addressing an audience of seven-year-olds. How do you explain an abstract concept such as liberty to little concrete minds? How do you relate to them the meaning of the values we hold dear? Another of my “tweeps,” @JoetheMailman, sent me a youtube link to Kennedy’s “ask not what your country can do for you” speech. It inspired me to talk about the sacrifices made by our men and women in uniform. But, there again, sacrifice is an abstract, so I’ll have to come up with a more concrete definition. So, here’s my game plan. First, present the Declaration of Independence statement on basic human rights. I’ve printed it in large, arial font that a second grader can read. I’ll have them all read it aloud. Then, I’ll break it down into language they can better grasp. It is obvious that God gave us the right to live, be free and be happy. And they're our rights to keep. These rights are worth fighting for, which is why I, and thousands of others, have worn the uniform and have served our country. And thousands still are serving today to protect our rights to be alive and free. Finally, I will challenge them to never pass up an opportunity to say thank you to our veterans and those who protect us today.